I first met Paul Cookson in the early 1980s at an Arts Festival called Greenbelt. Back then he was writing poems for adults and selling them in self-published booklets on the “fringe” area of the festival. A couple of years later he had found his true vocation and graduated to writing poems for children. 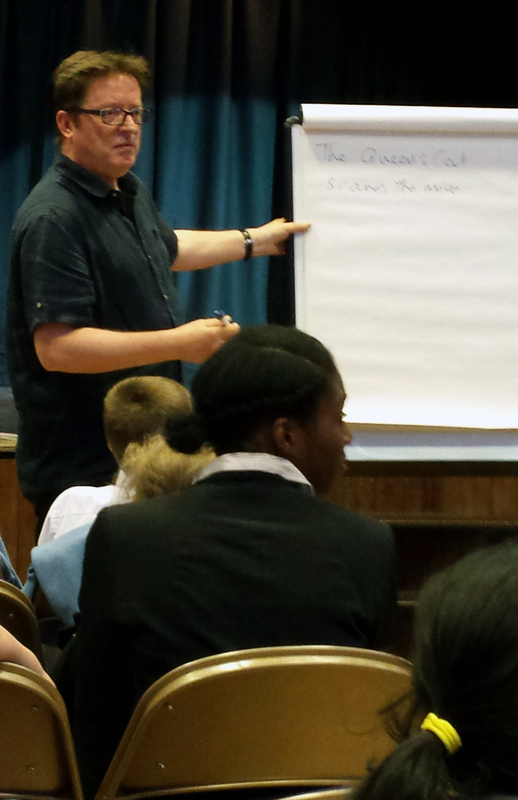 We started doing schools presentations of his work about 15 years ago and when I opened the theatre “Ravenscourt Arts@ Ravenscourt Baptist Church”, his performances became a regular if occasional part of our repertoire at the theatre as we have invited Paul to work with local schools groups. 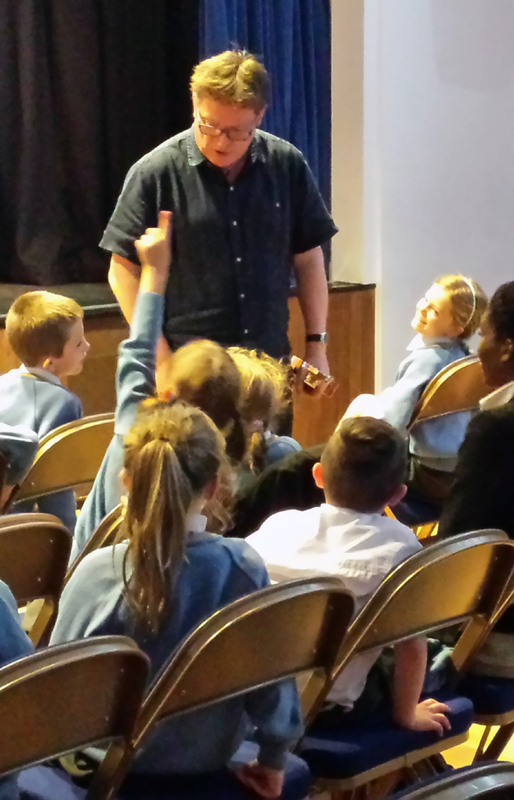 This tradition continued in May 2016 as over 800 young people joined Paul over 6 events and laughed, worked with words, invented rhymes, and wrote their own poetry. Over the period that I have worked with Paul his public performances have remained broadly the same. This isn’t because the poems in his performances are necessarily his best poems but they are the ones that children who are hearing him for the first time react most fully towards. He has an innate sense of what works best in this situation. Schools from all over West London had gathered for these shows for just that reason. The young people are drawn in. They join in the lines they are given and the choruses with all their heart. All of this means that by the time that the second half of the show comes around, Paul is their friend and they all want to be the one who is asked to present a question to him. They ask about his influences, about how he became a professional poet and what are the things that he likes to write about. Amongst the fun poems, Paul will occasionally sprinkle in an inspirational or devotional poem like “Let No One Steal Your Dreams” or “Invisible Magicians” and the newer “Footprints” which is based upon his Christian beliefs. After the questions there is still time for the whole of the group – up to 150 at some performances – to work together on a community poem. All of a sudden people who didn’t think they could write poetry are finding a new skill. 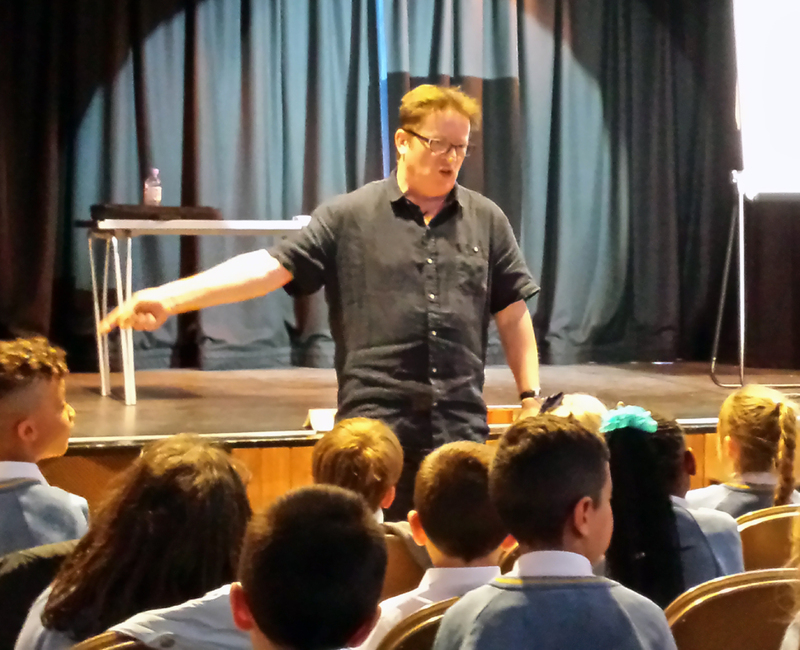 Working with and hosting Paul Cookson is a real privilege. We look forward to his next residence at Ravenscourt Arts.